We are in Valencia, Spain and this is our 2nd week here. Valencia is the third largest city in Spain after Madrid and Barcelona. 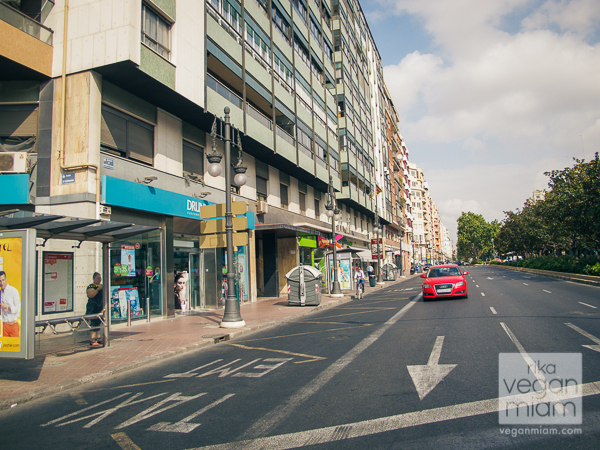 We are staying in a 2-bedroom flat off a major street in Valencia, not too far from the Old Town area (Ciutat Vella). Ciutat Vella is a popular area for loads of tourists and I don’t like tourist spots (hehe). I’ll mention the area in the next post. We have three weeks left here in Valencia, Spain! Here is an Instagram photo of the evening view from the flat’s balconies. The flat is pretty big for a couple and I will show a couple of pictures later in the next post. 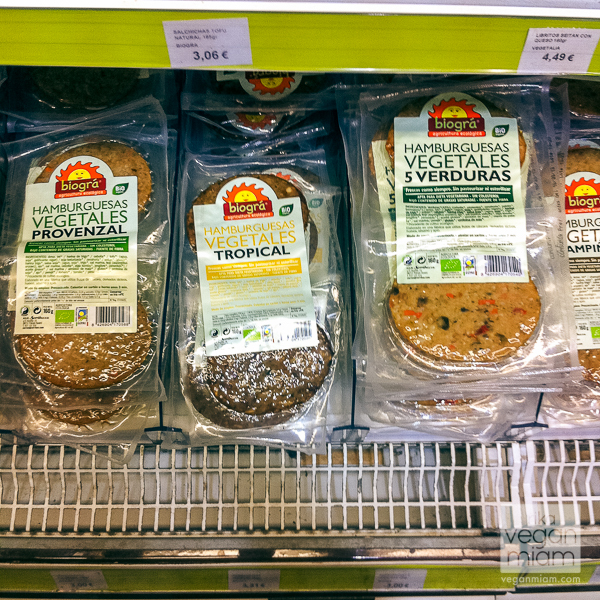 Anyway, back to the topic, I would like to share our first week’s vegan finds at groceries in Valencia, Spain. 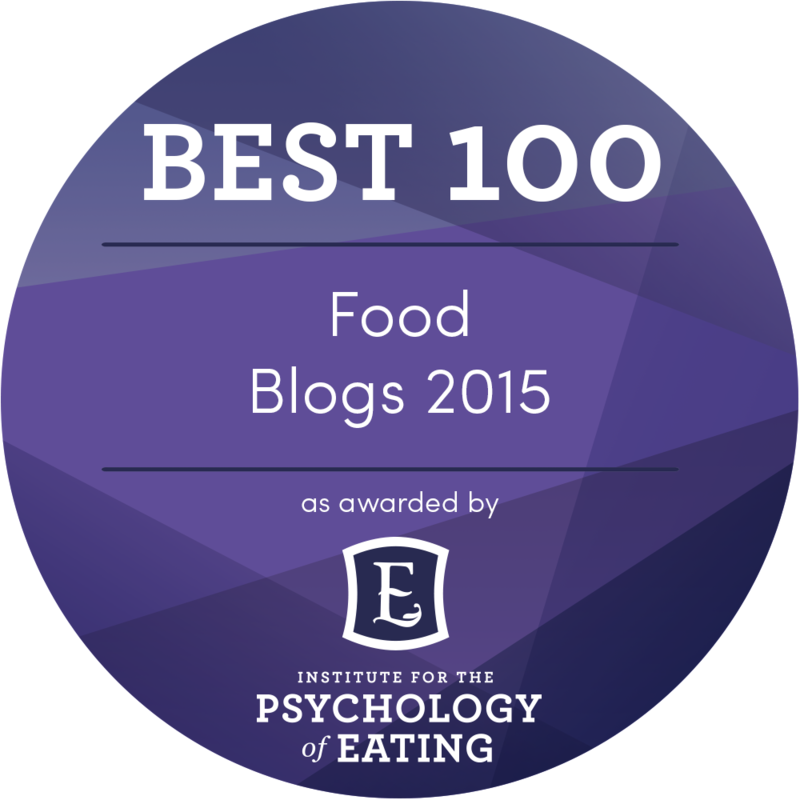 Beware, this will be a lengthy post filled with vegan and vegan-friendly products. 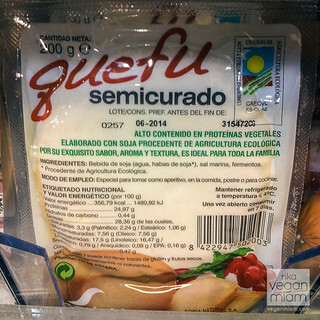 I saw a couple of vegetarian chorizo and meat alternatives that contain huevo (egg) or queso (cheese), but I won’t mention them in the post. 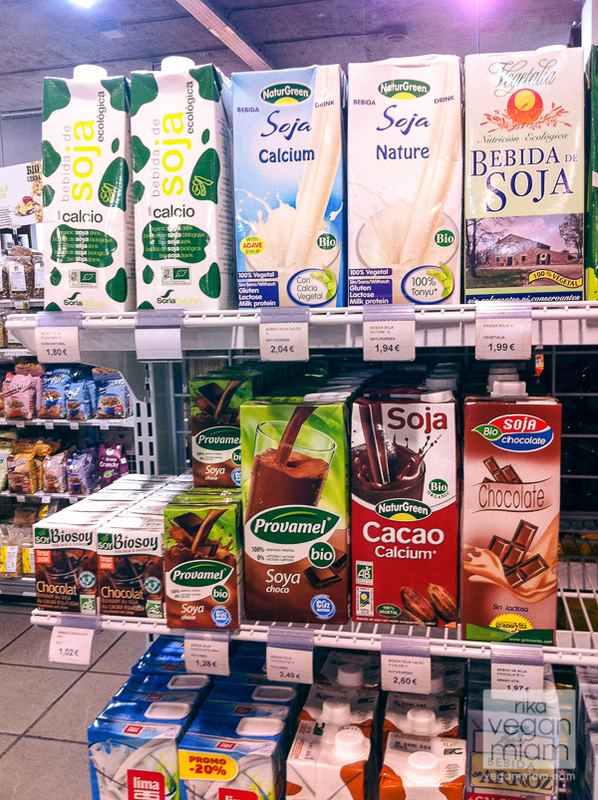 Some products will state that they do not contain dairy (known as sin lactosa), does not mean that they are 100% vegan. 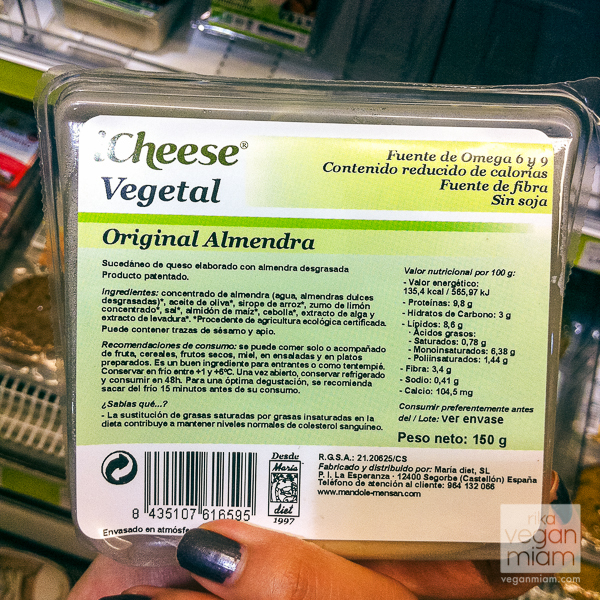 Always double check the ingredients, bring a list of vegan ingredients in Spanish or an offline dictionary if needed. 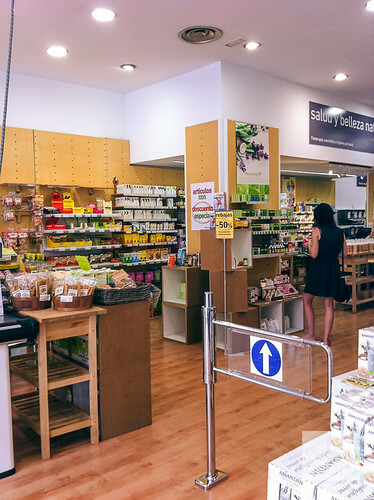 Surprisingly, we found few vegan-friendly groceries that aren’t listed on Happy Cow Valencia. 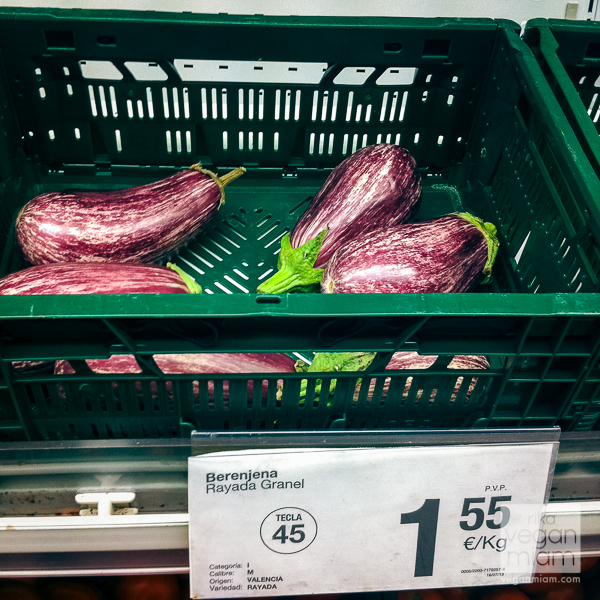 Our favorite groceries are Herbolario Navarro, Ecorgánic Ecomarket, and El Corte Inglés. 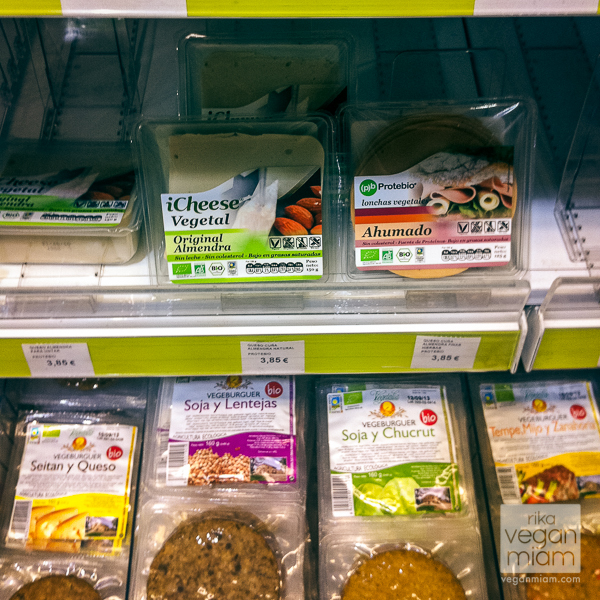 They carry a great selection of vegan and vegetarian products including local brands. 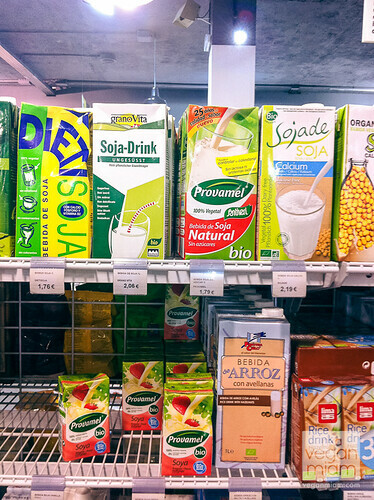 Consum and Mercadona are common supermarkets that you will be able to get basic goods, i.e., cheap water bottles, juices, gazpachos, cereal, cleaning products, etc. The Yuen Tong Supermercado Asiatico is a perfect destination to get Asian staples, and they have Sriracha and my favorite light soy sauce! Herbolario Navarro is a pretty impressive health-food and grocery store. 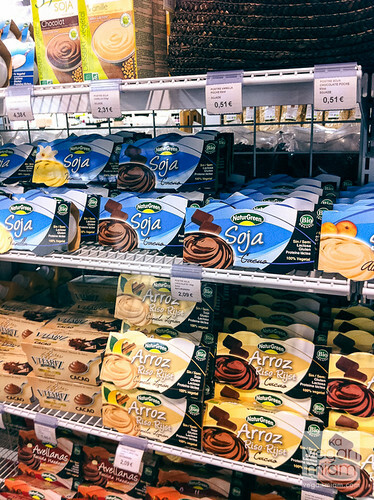 It is one of the coolest groceries I have been to in Europe, it is like walking through a vegan warehouse. It is massive, modern and clean. 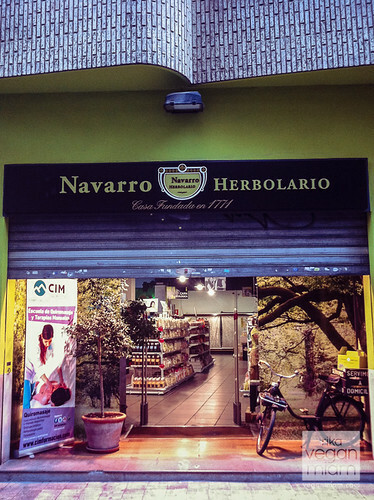 Herbolario Navarro is located in three cities in Spain: Valencia, Mallorca and Castellón. I highly recommend this central location: Calle San Vicente 63 and it’s bigger than the rest of the locations. It also has a cafe with a healthy menu (including Wi-Fi), which is a huge plus. I will have to check out their cafe this week and ask about vegan options. 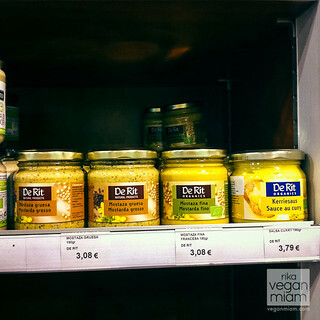 Herbolario Navarro: A collection of vegan condiments (yes, mayo!) and sauces, of course coconut oil. 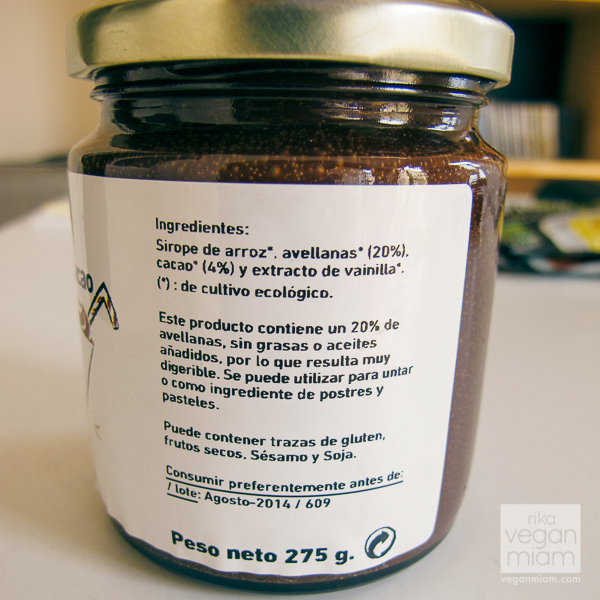 Herbolario Navarro: Did you see the word on the top: Producto Vegano? It’s vegan! 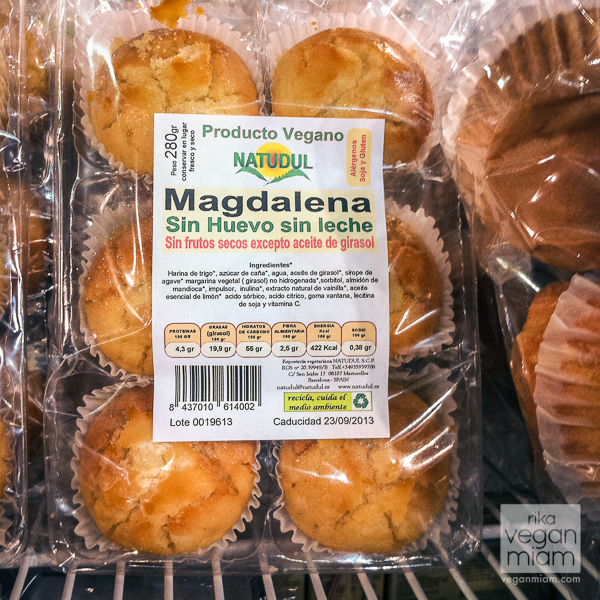 Magdalena (small, slightly lemony, sweet little Spanish cakes) does not contain milk or eggs. I really want to try this one soon this week. 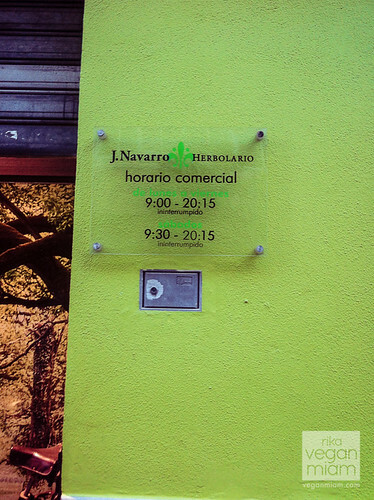 Herbolario Navarro: Plenty of vegan-friendly prepared meals, i.e., paella or quinoa with vegetables. 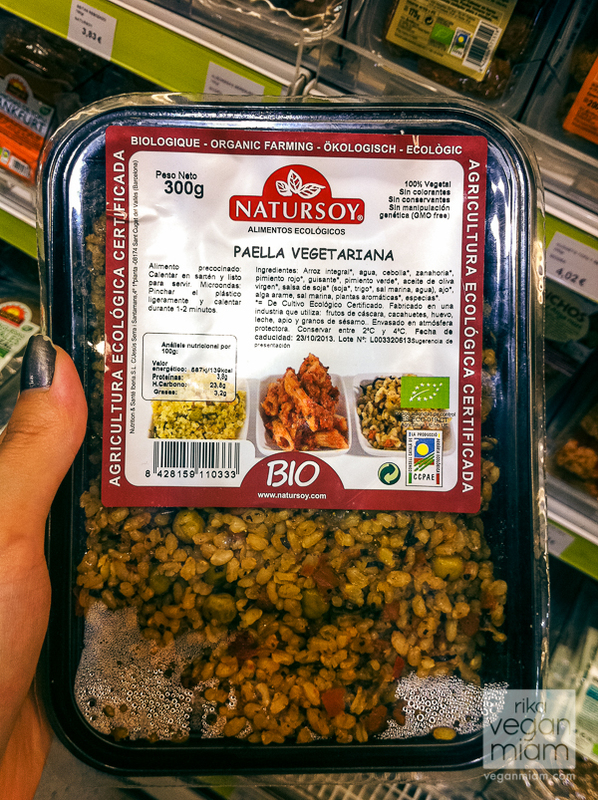 I saw a lot of products by this Spanish brand, “Natursoy“, but not all products are vegan. The brand is based in Barcelona, but you will see loads of them here in Valencia. 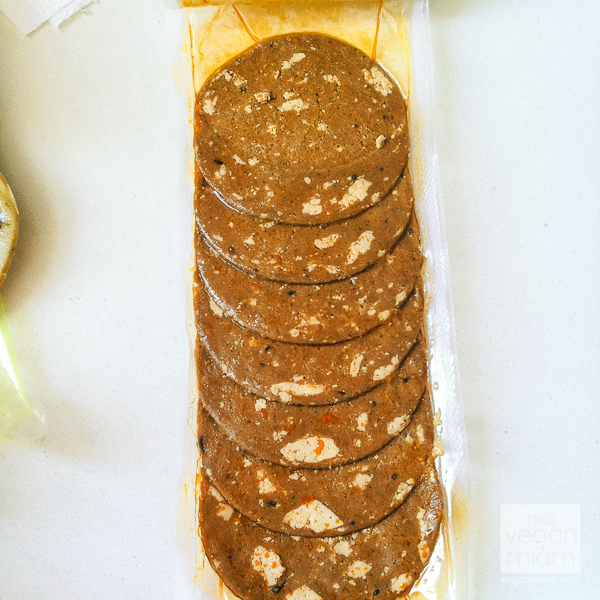 They sell a lot of products from seitan to prepared meals. 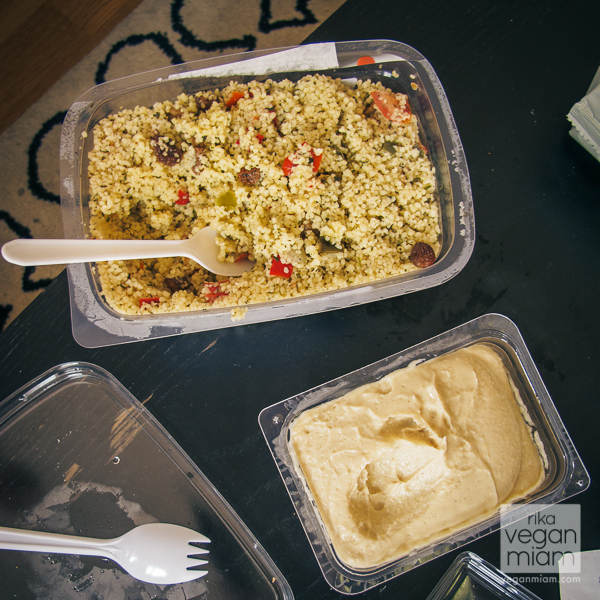 Herbolario Navarro: Plenty of awesome vegan rice, coconut, nut-based puddings in a variety of flavors. Herbolario Navarro: This is what we’ve bought: Tofu Salami, Tofu Slices, Cheezly Cheddar, and Lemon-Cinnamon Rice-Based Pudding (not Rice Pudding). 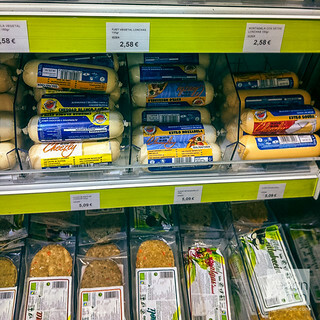 We got the Tofu Slices (comes in three flavors) from the other health food shop, Ecorgánic Ecomarket, and it’s slightly cheaper than the Tofu Salami. 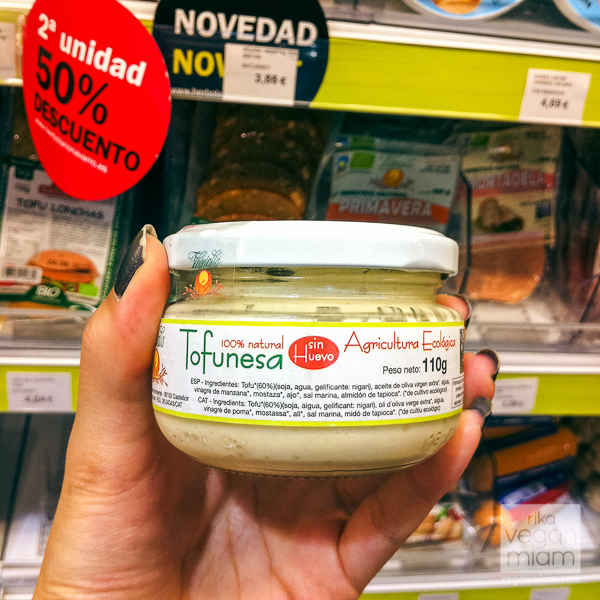 I tried the Lemon-Cinnamon Rice-Based Pudding by NaturGreen (another Spanish brand) and it was pretty bland and starchy (thick). I didn’t like the cinnamon and lemon together. 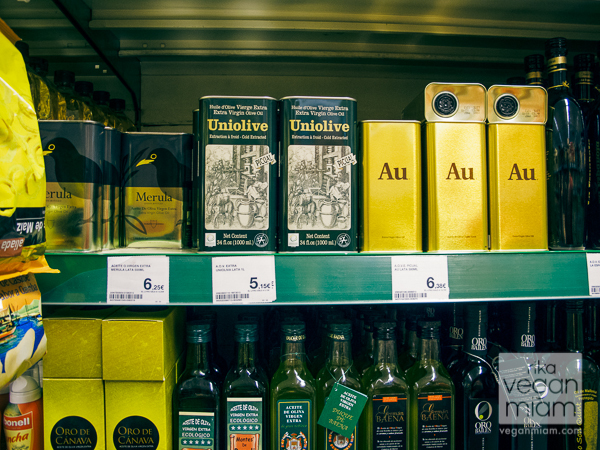 I think I prefer the Provamel brand (Belgian) puddings. 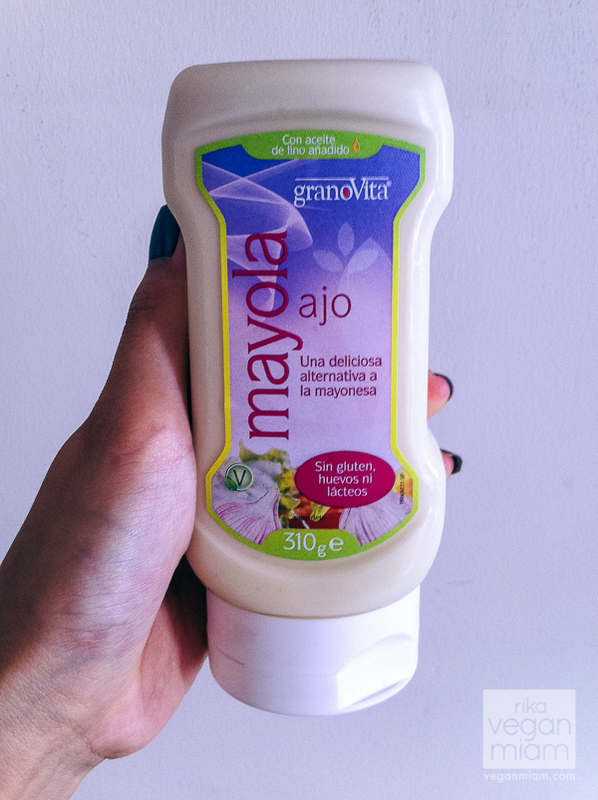 Herbolario Navarro: Vegan and gluten-free mayo with garlic by Granovita. It reminds me of a thick salad dressing, but creamy. It’s really good in sandwiches or on its own with raw veggies. I didn’t taste the garlic at all, but it is still good though! Ingredients are pretty simple: sunflower oil, water, vinegar, apple juice, soy protein, corn starch, sea salt, garlic, mustard. 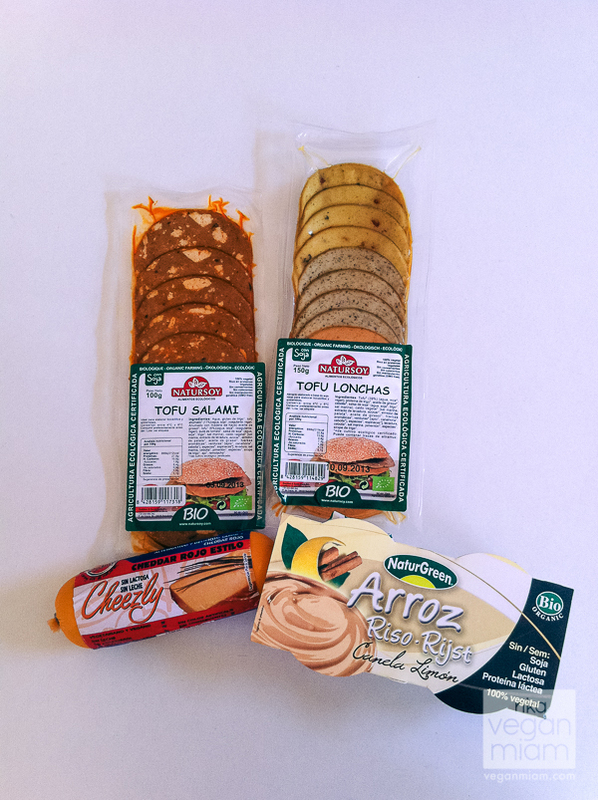 Herbolario Navarro: This is what it looks like, Vegan Tofu Salami Slices and Vegan Tofu Slices. I personally like the Vegan Tofu Slices because it comes in three flavors (one of them is curry). The Salami slices are a bit crumbly for me and have a mild pickled flavor. Herbolario Navarro: We’ve been making a lot of couscous lately in Spain. It’s quick and easy. 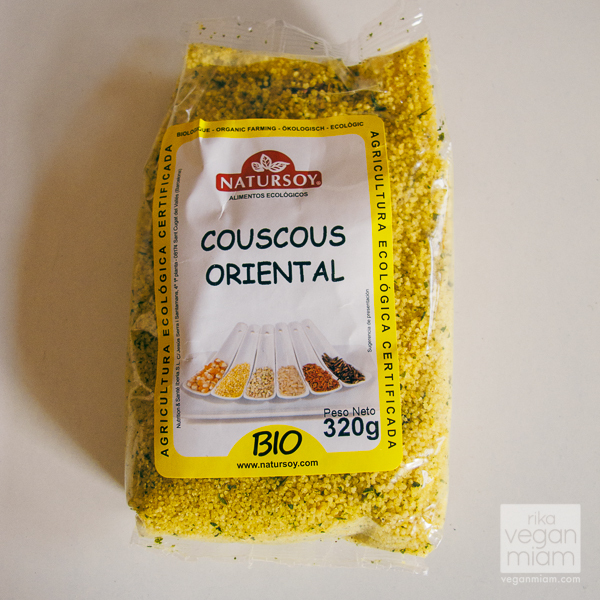 We found an organic Oriental CousCous package, also by a Spanish brand, NaturSoy. I can’t wait to try this! It looks so good! 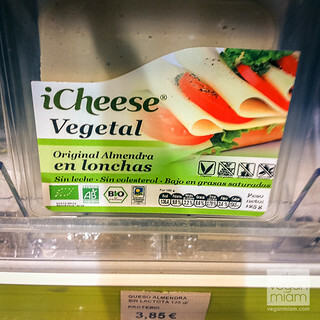 I am amazed that there are a lot of vegetarian and vegan-friendly Spanish brands. 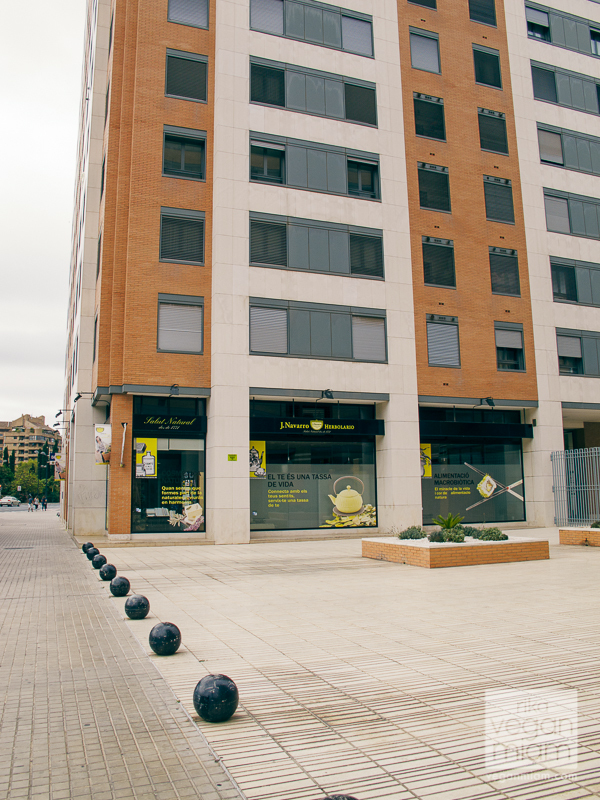 This is another Herbolario Navarro location near the Mestalla stadium (football): Aragón Avda. Aragón nº 13. It is a bit far from where we are staying, plus if you are a huge football fan and staying near the stadium, be sure to stop by that awesome grocery store. 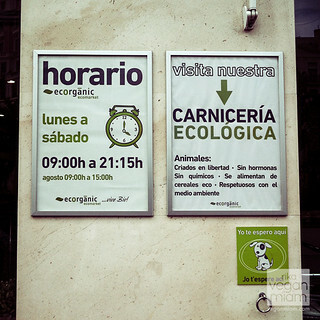 Ecorgánic Ecomarket is closer to our flat, and it’s smaller than Herbolario Navarro. 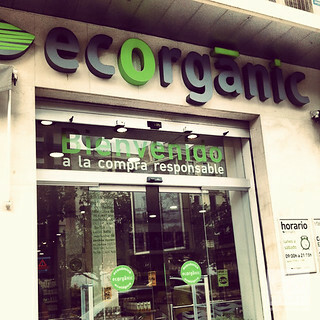 According to their website, Ecorgánic is an organic supermarket in Valencia that offer macrobiotic, gluten-free, lactose-free products, including products available to people with diabetics, as well as natural lifestyle products and cosmetics. hours: Monday – Saturday: 9:00 am – 9:15 pm, Closed Sundays, however August has shorter hours 9:00 am – 3:00 pm. 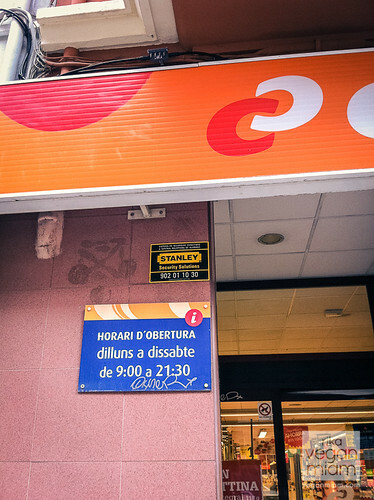 Ecorgánic: is on the left, near the 2nd bus waiting stop or across the red car. It’s pretty easy to spot. They have shorter hours 9:00 am – 3:00 pm in August due to holidays. I’m glad August is nearly over, so the hours will be back to normal! Ecorgánic: You probably have recognized my Instagram photo. 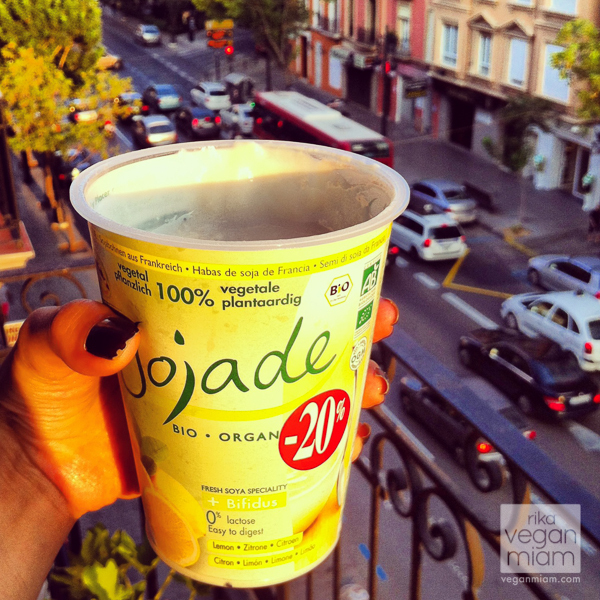 We got the Sojade Lemon yogurt at that grocery store, Ecorgánic and it was 20% off (only expiring in a few days). It was a pretty good deal for a good tin of yogurt. I love Sojade. 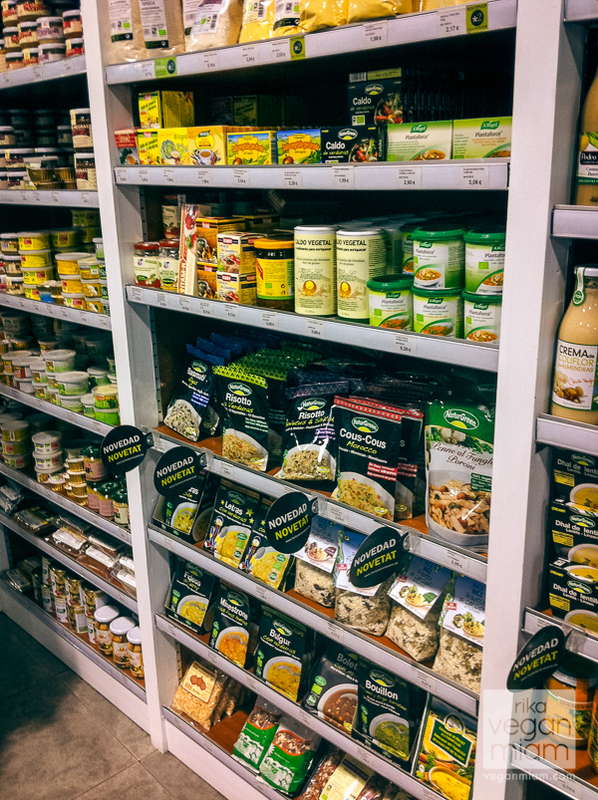 I find their yogurts more flavored than the yogurts in the U.S.
Ecorgánic: Curry Vermicelli Noodle Soup and Mushroom Miso Soup packets. 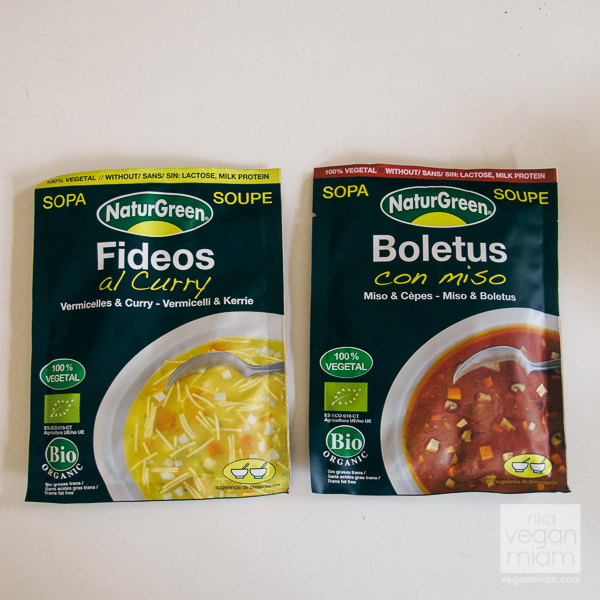 The NaturGreen soup packets are also available at Herbolario Navarro, but we got them at Ecorgánic instead because it was closer to our flat. Each soup packet costs €1.60. NaturGreen is also a Spanish brand. 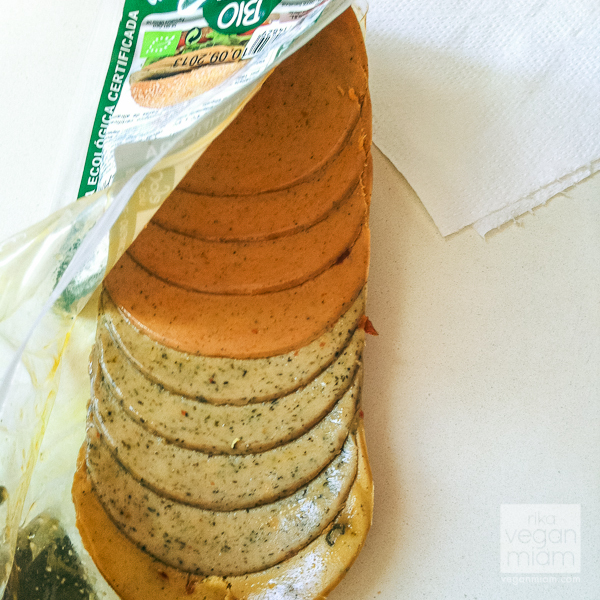 Aren’t these vegan soup packets tasty, plus they are organic? 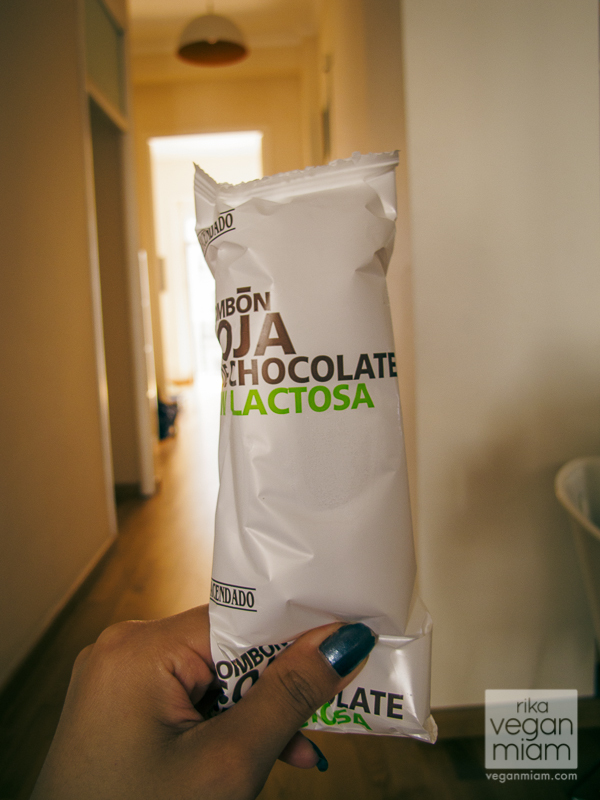 I love the fact that they placed the notes above the packets: Without Lactose, Milk Protein. I’m very impressed with their labels! Ecorgánic: This tastes divine. 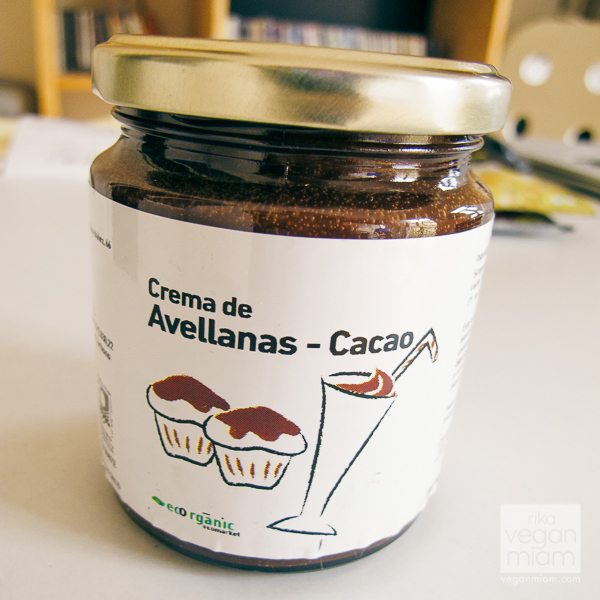 Vegan Cocoa-Hazelnut Cream by the grocery store, Ecorgánic: It is a gooey version of vegan Nutella, and great as garnish on desserts or on a piece of good bread! Love this! 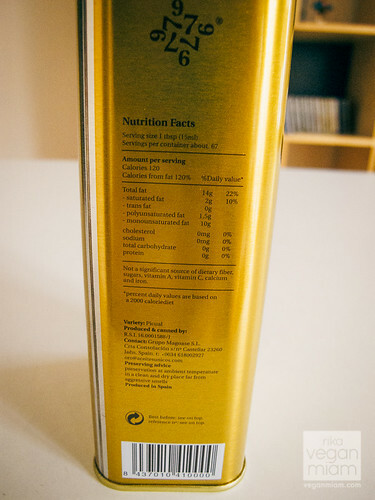 The ingredients are Rice syrup, hazelnuts (20%), cacao (4%) and vanilla extract. This costs €3.90. 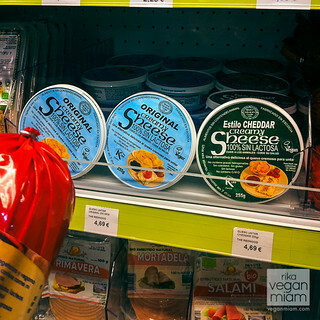 Ecorgánic: I love the label “vegan”, and the organic vegan margarine is 10% off at Ecorgánic. 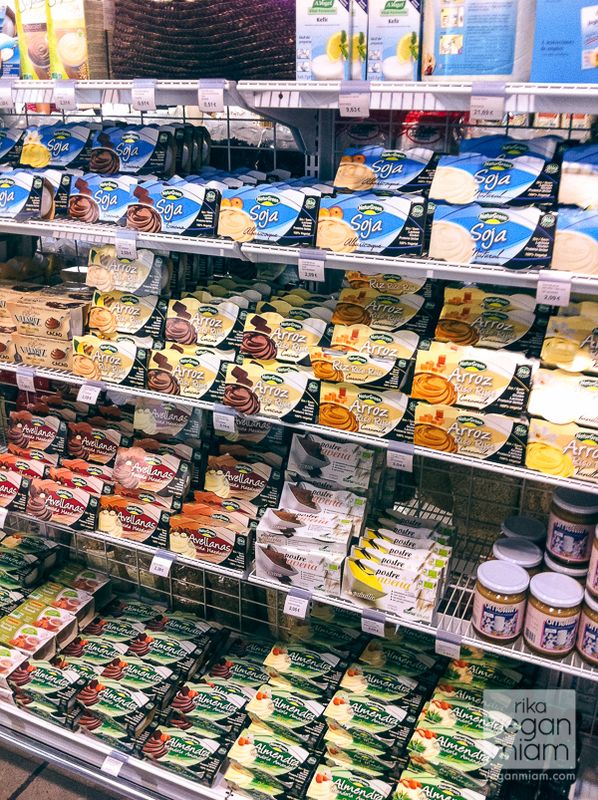 Surprisingly, the grocery store has a special section called, “Special Line” dedicated to health-conscious products (lactose-free, gluten-free, etc.) and some of the products are vegan. For more information about their products, click here. 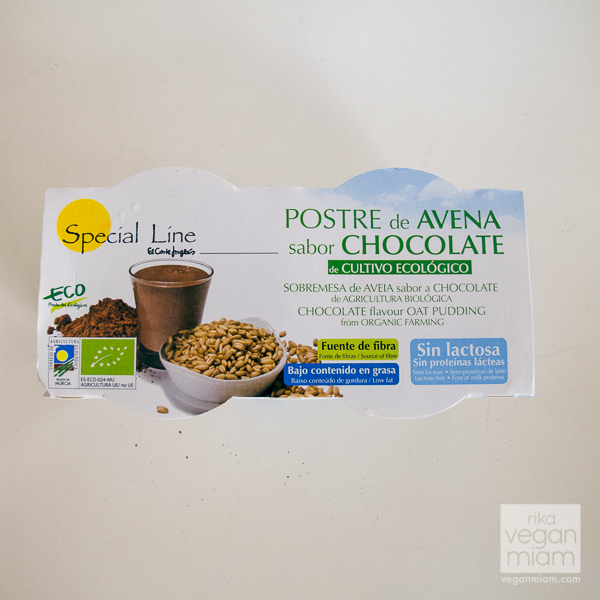 This is one of the El Corte Inglés, Special Line’s vegan products: Chocolate Flavored Oat Pudding from Organic Farming. 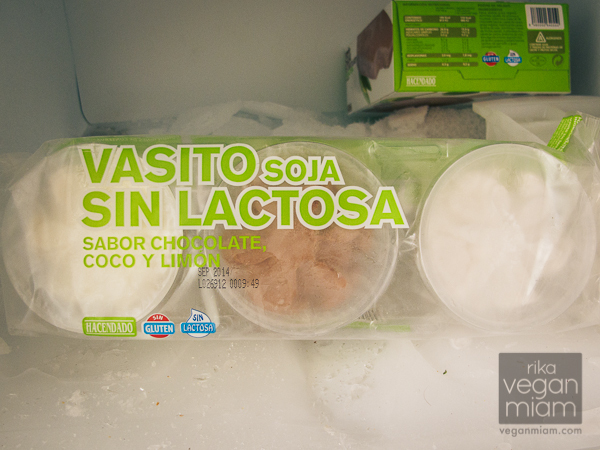 It has a label, “Sin Lactosa” and “Sin Proteínas Lácteas”, meaning without dairy or milk/dairy protein. It was a light chocolate sauce/pudding, not creamy at all, I’m not sure I’ll get it again. But I will love to try their Special Line vegan yogurts (I saw them in berries, peach, and other flavors). 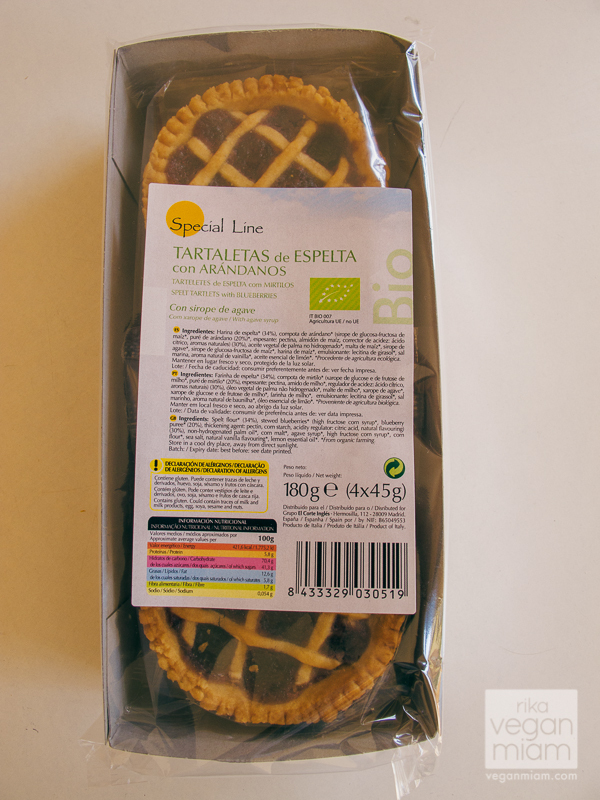 Here’s another product from El Corte Inglés, Special Line: Tartaletas de Espelta con Arándanos (Blueberry Spelt Tartlets) and with agave syrup. Yes, they are vegan, but contain gluten. They are perfect for breakfast to go. The tartlet is individually packaged and there are four in total. This costs €3.10. 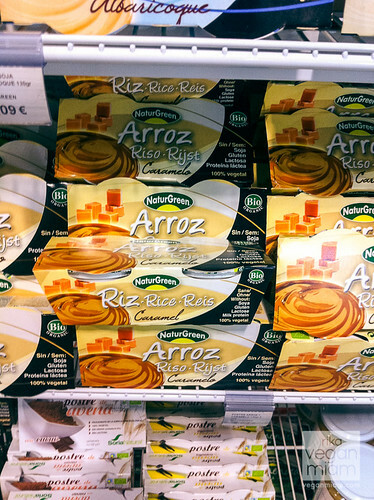 El Corte Inglés: Organic Soja Caramel Dessert (Pudding) by Provamel (Belgian brand). 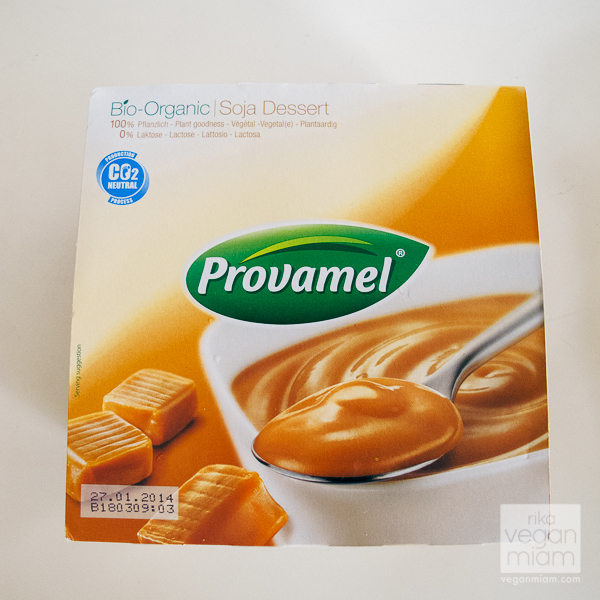 I love Provamel puddings! I had them in Germany and Denmark many years ago. 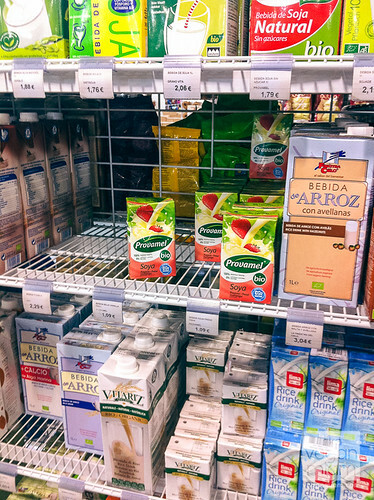 El Corte Inglés has a small variety of Provamel soya milks, creamers, and puddings. 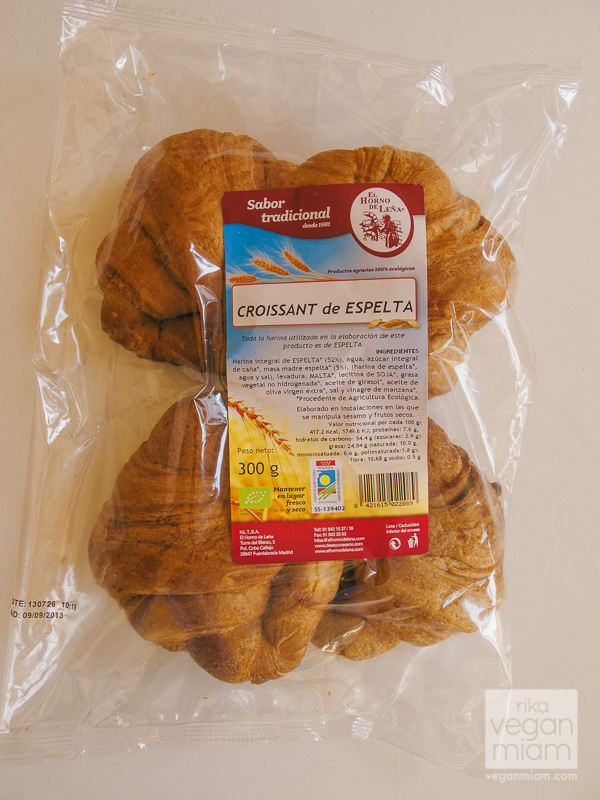 El Corte Inglés: Vegan Spelt Croissants by a Spanish artisan bakery, El Horno de Leña (based in Madrid). We saw the brands in multiple stores. It’s amazing to see packaged vegan pastries. I bet they are tasty with the Hazelnut-Cacao Cream I got at the other grocery store. There are four pieces in the package, cost €4.20. 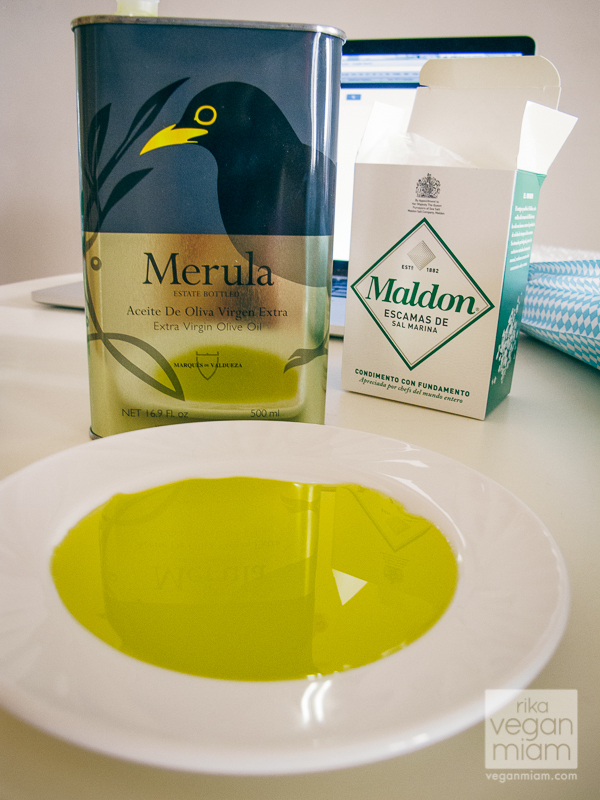 El Corte Inglés: We tried two amazing Spanish extra-virgin olive oil products: Merula and Au. 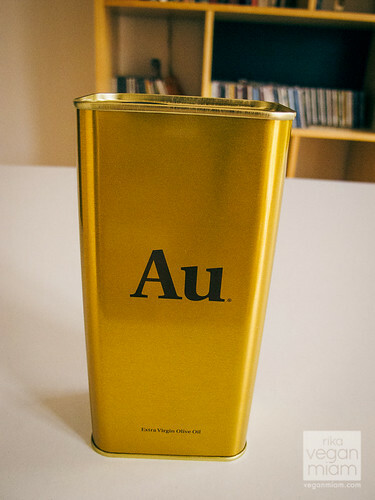 I love the chemistry element, Au used for the product, “gold.” We love the Merula for its rich, sweet buttery flavor and great for dipping, and the Au for its peppery tones, perfect for garnish, but not for dipping. 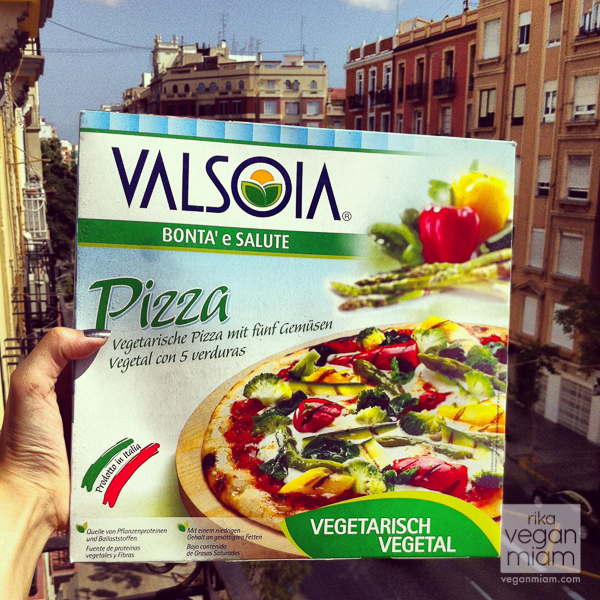 El Corte Inglés: We found a frozen vegan cheeze + veggies pizza by Valsoia (an Italian brand) in the freezer section, I remembered trying their packaged delicious vegan sundaes in Rome, Italy. I haven’t tried it yet, and it is still in my freezer. I will let you know if it’s any good or not. The pizza is about €4.13. 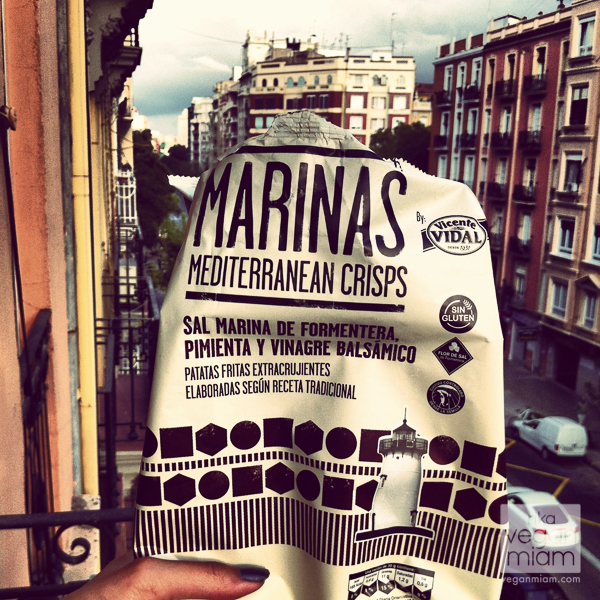 El Corte Inglés: We found a bag of vegan and gluten-free potato chips with sea salt, pepper and balsamic vinegar. It didn’t taste sour, but mostly salt and pepper. I like my chips salty and sour, maybe I like the British versions. 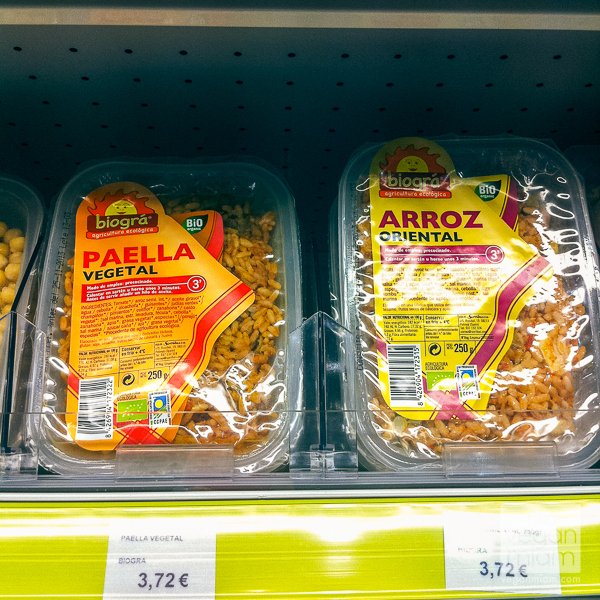 El Corte Inglés: It doesn’t hurt to have tabbouleh and hummus around. 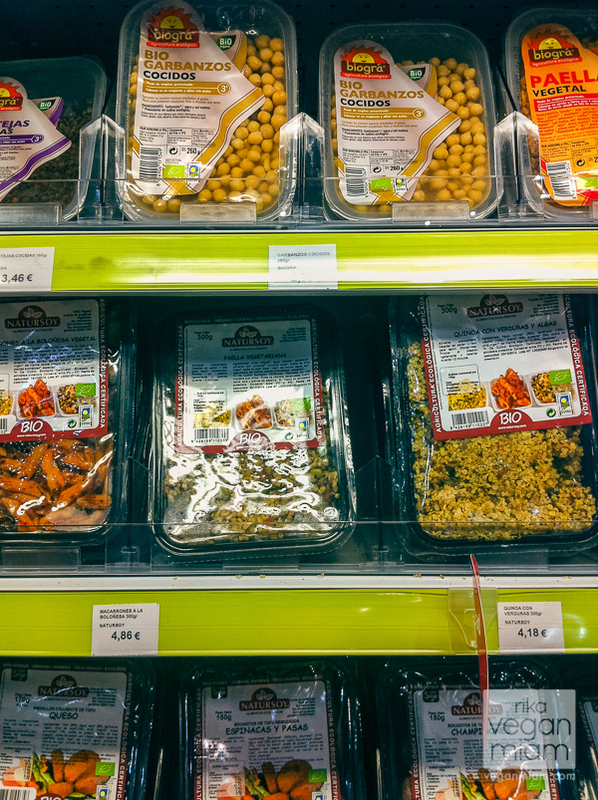 I’ve seen the tabbouleh package before, somewhere in France, or the UK (I don’t remember), but it’s vegan. The hummus is from Greece and creamy. Pretty cheap. 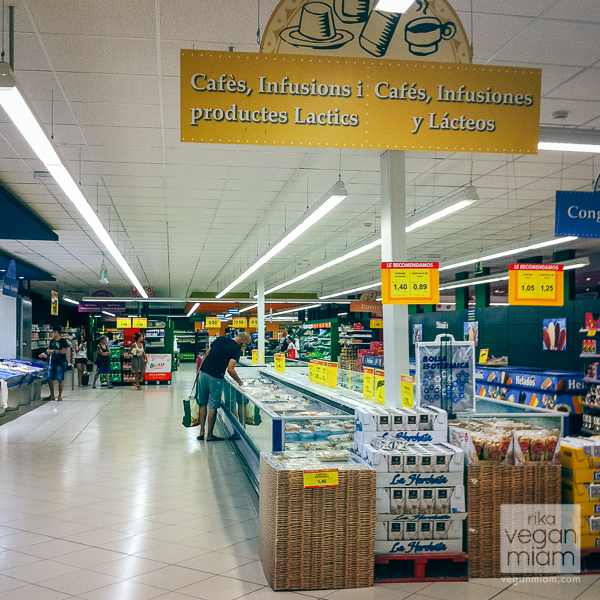 Mercadona is a Valencia-based supermarket chain and I love Mercadona because their store brand makes vegan-friendly ice cream products! 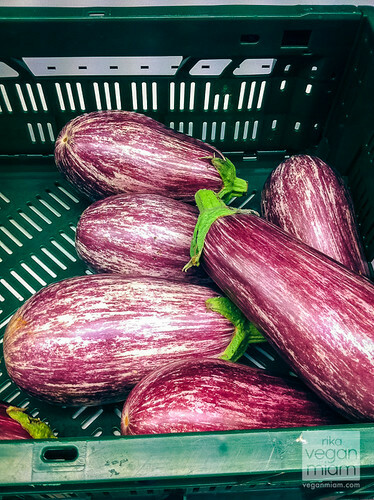 You will also find the standard grocery products there, including fresh produce, frozen foods and toiletries. There are tons of store locations, but here is the address below that we used to go to. 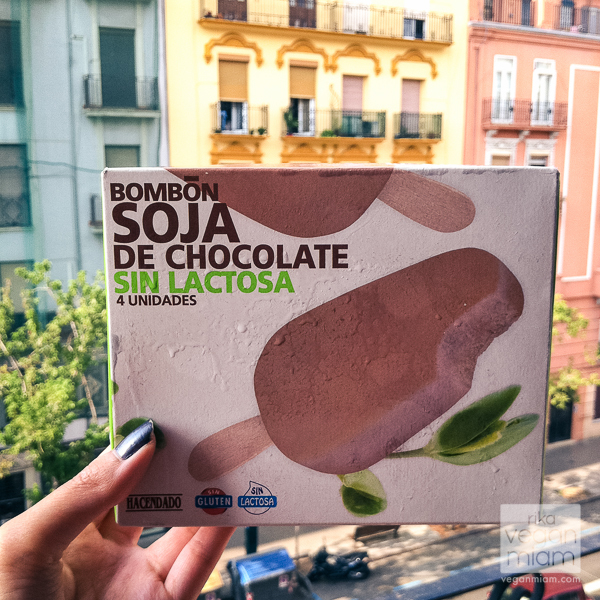 Mercadona: Bombon Soja de Chocolate Sin Lactosa (4 Unidades). 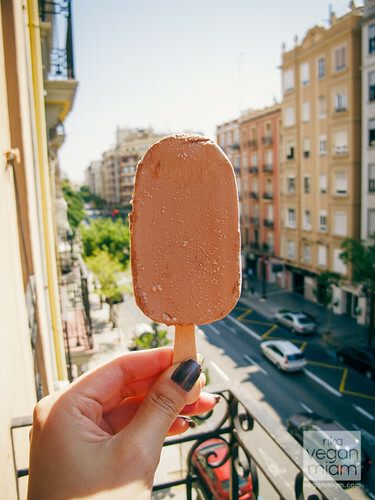 Vegan and Gluten-Free Chocolate Popsicles. I thought they were pretty cool, but too heavy for my sweet buds. They reminded me of frozen chocolate mousse. 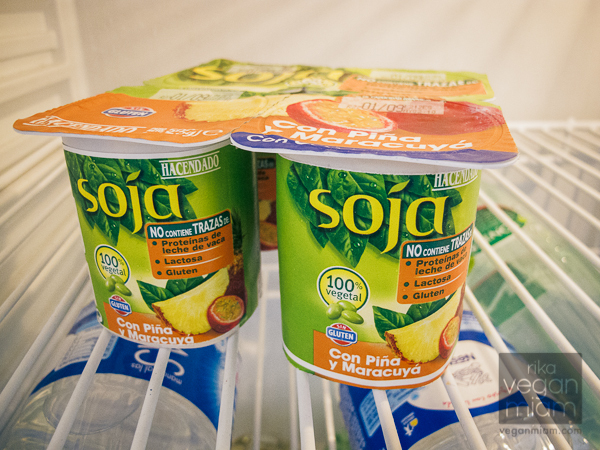 Mercadona: You can find these soy yogurts at most Spanish groceries. I forgot where are they from, but they contain no gluten, dairy or milk protein. I tried the Pineapple & Passion fruit flavor, and I didn’t like the texture and the flavor (tasted artificial). It wasn’t for me. 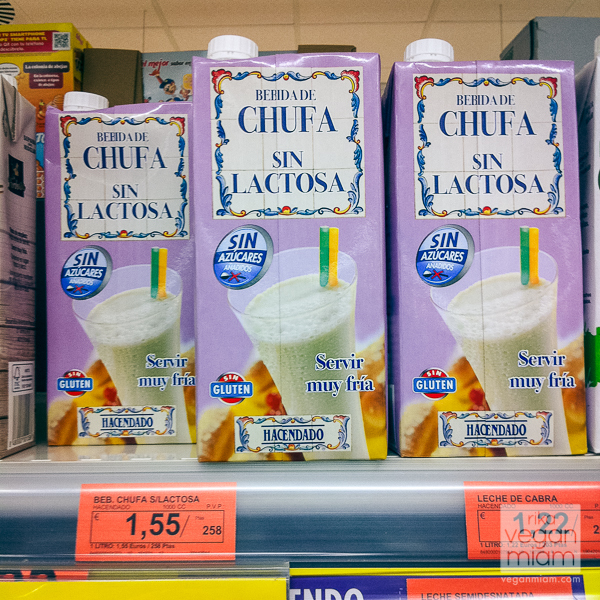 Mercadona: Bebida de Chufa Sin Lactosa, vegan horchata. I was excited to try it, but I didn’t like the fake sugar used in the product. It tasted funny. 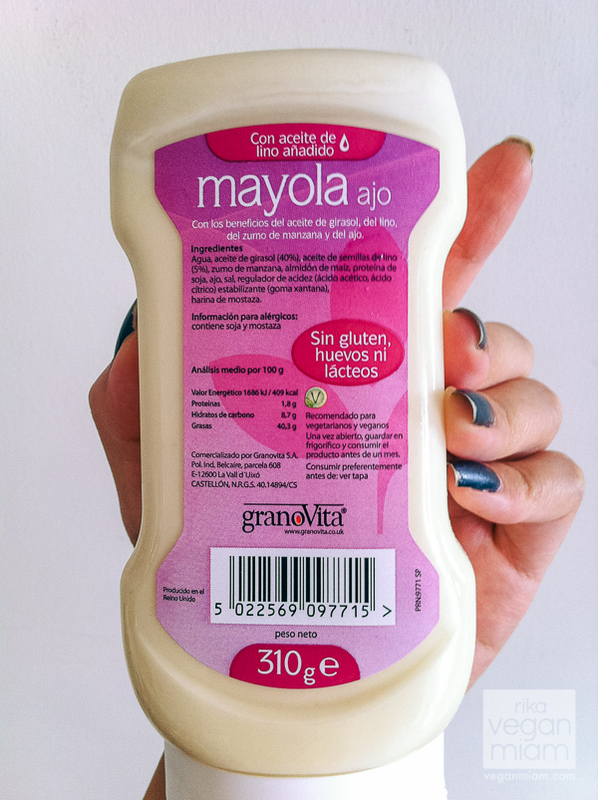 It is hard to find a vegan horchata product! 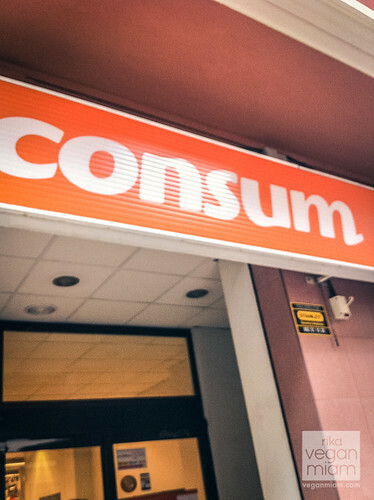 Consum is a medium-sized grocery store that is often found in city centers in Spain. 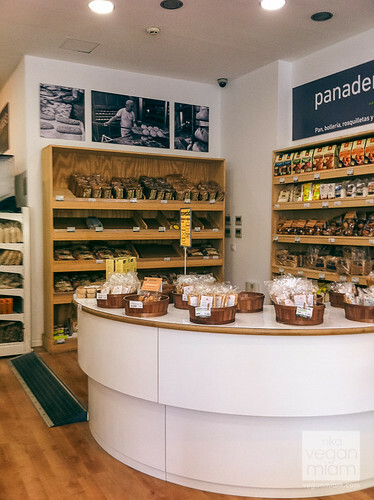 There are few Consum store locations near our flat, we like going to this store at this address: Calle Historiador Diago, 7. The store is great to get affordable water bottles and beverages, or even basic pasta sauces or grains during your stay. 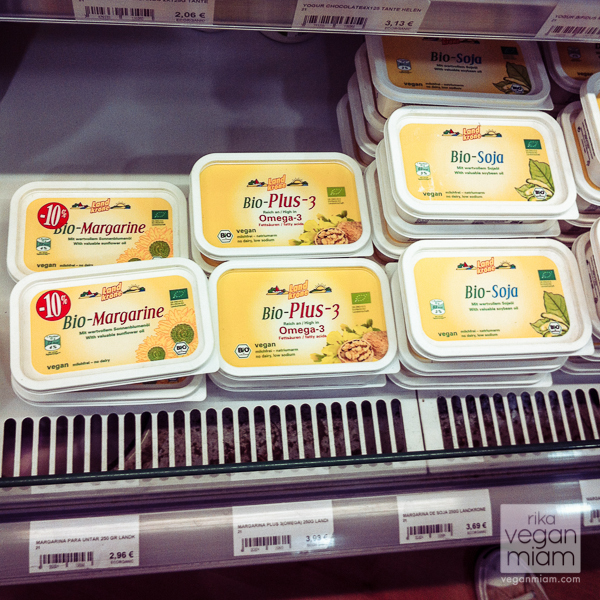 We also found vegan Alpro Soja milk products at Consum, including the Lemon Ice dessert. 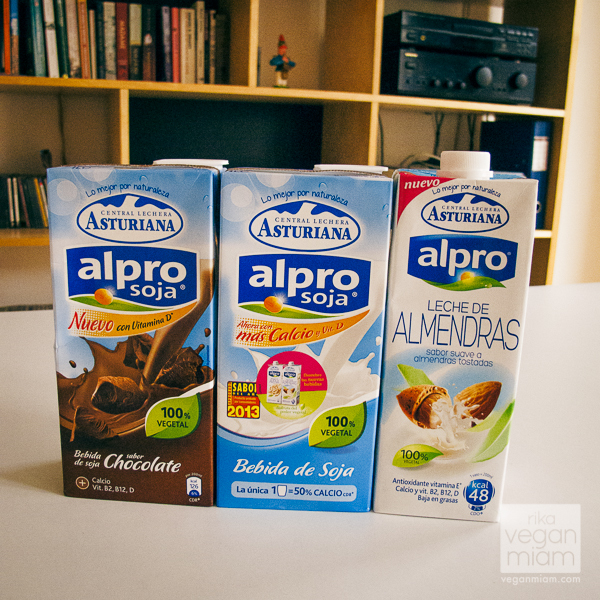 Consum: Alpro Soja’s Soya Chocolate Milk, Soya Milk, and Almond Milk. Oh my, the Almond Milk is so delicious. I can taste the rich almond flavors. Oh my, this is probably the best vegan almond milk ever, compared to the ones I’ve tried in the U.S. (they tend to be slightly watery or bland). 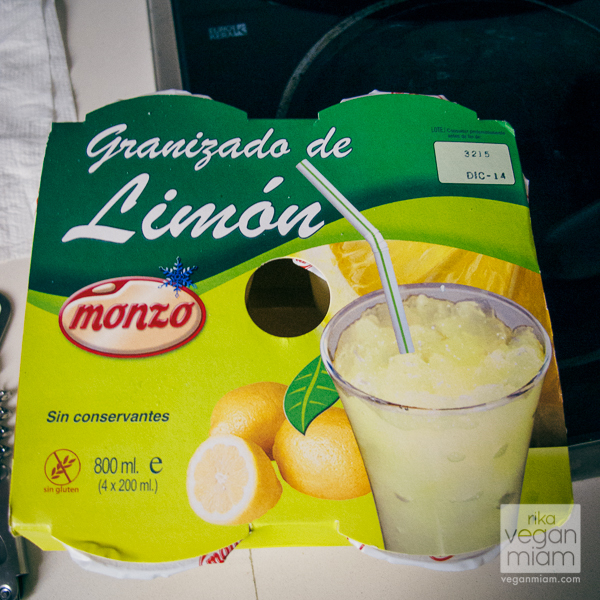 Consum: Granizado de limón. It’s a sugary lemon slush/ice dessert, perfect for the summer heat waves. However, after consuming 1-2 in a row, it can be quite sweet and you might get sick of it easily. 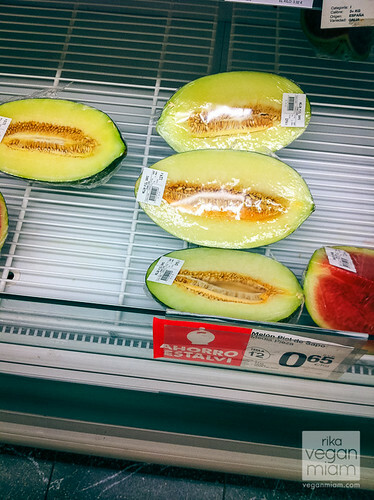 You need to let it thaw for at least 30 minutes before consuming. There are four cups in the package. 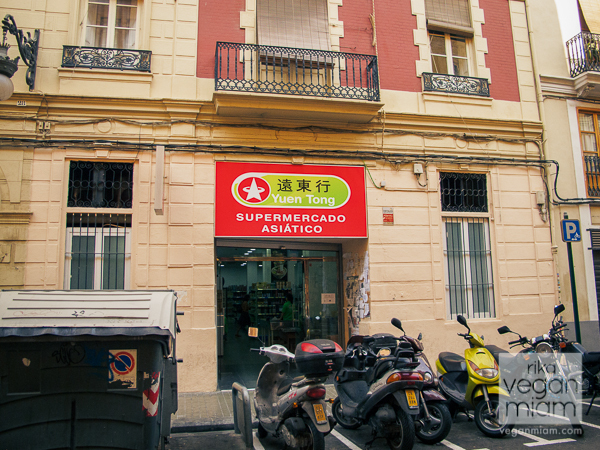 It is my favorite Asian supermarket in central Valencia. There is where I found my Sriracha, I’ve been using it daily! There are other Asian supermarkets on the same street or in the same neighborhood, but they are smaller. 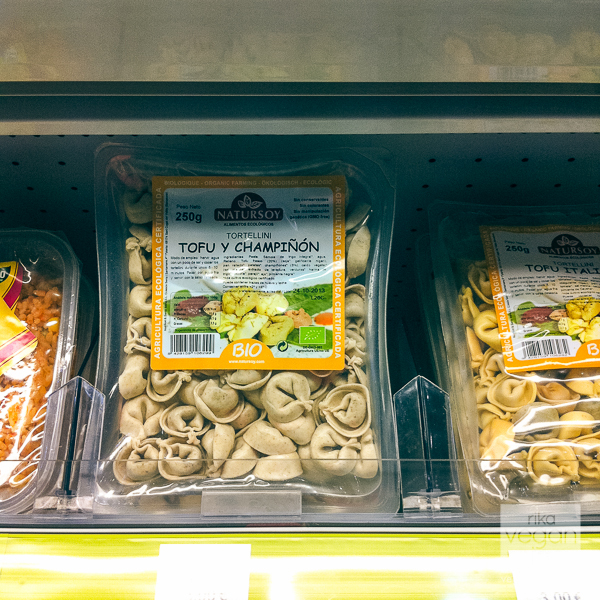 I didn’t take any interior photos, but they have very few vegan-friendly dumplings and noodle packs. 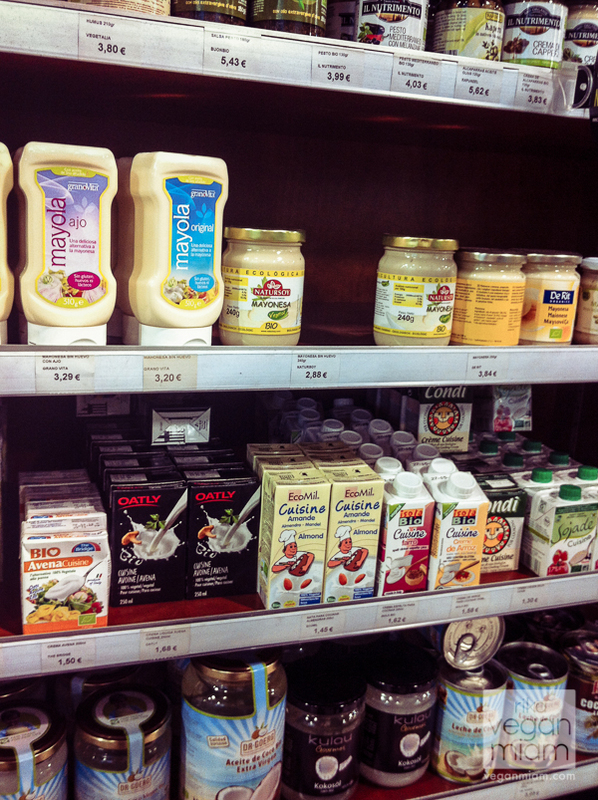 However, they carry a good selection of Asian staples and condiments. Taken at the back of my flat. 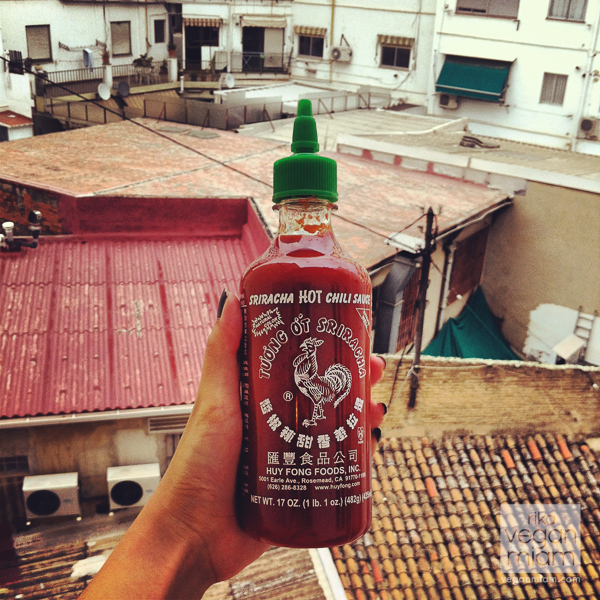 So cool looking Sriracha! I’ve used it in my cous cous, noodles, pasta, hummus and hopefully some paella!